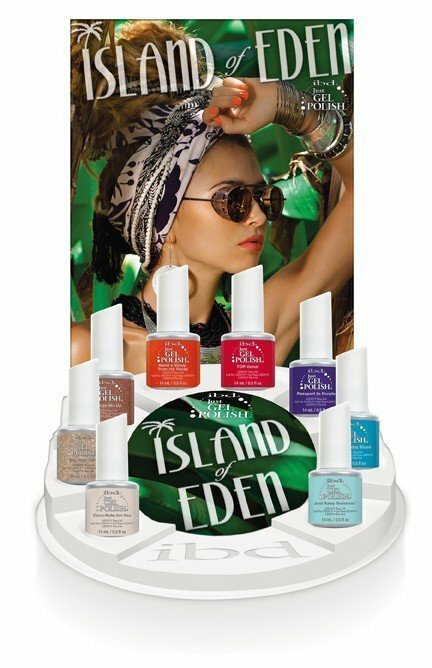 Transport yourself to a tropical paradise with the ibd Just Gel Polish Island of Eden 8pc Counter Display. This display is perfect for presenting ibdﾒs latest seasonal collection. Display includes; 24 ibd Island of Eden Just Gel Polishes, including Coco-Nuts-for-You, Dip Your Toes, Bronze Me Up, Need a Vacay from My Vacay, Top-tional, Passport to Purple, Post Holiday Blues and Just Keep Swimming.